After the successful community event of last year, Shahjalal Mosque Manchester once again would like to invite the community to take part in an Iftar. The Iftar is the meal eaten by Muslims after sunset following a day of fasting, where they have abstained from consuming food and drinking fluids from the break of dawn. To share the taste of Ramadan and to experience some of the blessing of Ramadan, why not take the challenge and fast with us from the break of dawn till sunset followed by a visit to Shahjalal Mosque where you are invited to enjoy the evening meal with the local community. 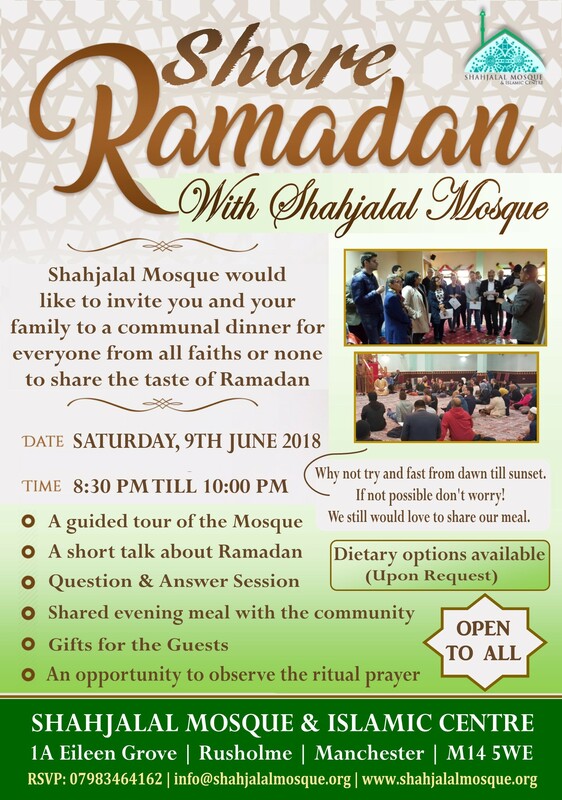 Don’t worry if it’s something that you can’t do, your local community still invites you to come and share the iftar meal at Shahjalal Mosque Manchester where you are invited to enjoy the evening meal with the local community, which is open for everyone from all faiths or none. Please RSVP by text or email. Please let us know if you have any dietary preferene.